SEATTLE, WA – August 2, 2002 – WizKids is pleased to announce a series of licensing deals with independent comic book publishers and creators that will significantly enhance the hottest game of the year, HeroClix. The combined deals will allow WizKids to release Indy HeroClix, a line of collectable miniature figures designed for use with the HeroClix game system. 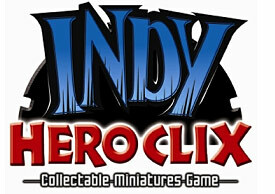 Considering the publishers that have signed on to date, Indy HeroClix will include characters from the universes of such noted comic book publishers as CrossGen Comics, Dark Horse Comics, Chaos Comics, Top Cow, and 2000 AD, as well as individual characters from creators J. Scott Campbell (Danger Girl), David Mack (Kabuki), and Billy Tucci (Shi). Founded by Jordan Weisman, WizKids is a Seattle-based game publisher dedicated to creating a new genre of games that is at once more accessible and more sophisticated than traditional adventure games. WizKids' best-selling game, Mage Knight, has been translated into seven languages and has sold tens of millions of copies in the United States and around the world. WizKids is also producing MechWarrior: Dark Age based on the BattleTech universe. For additional company information, visit the corporate Web site at www.wizkidsgames.com.